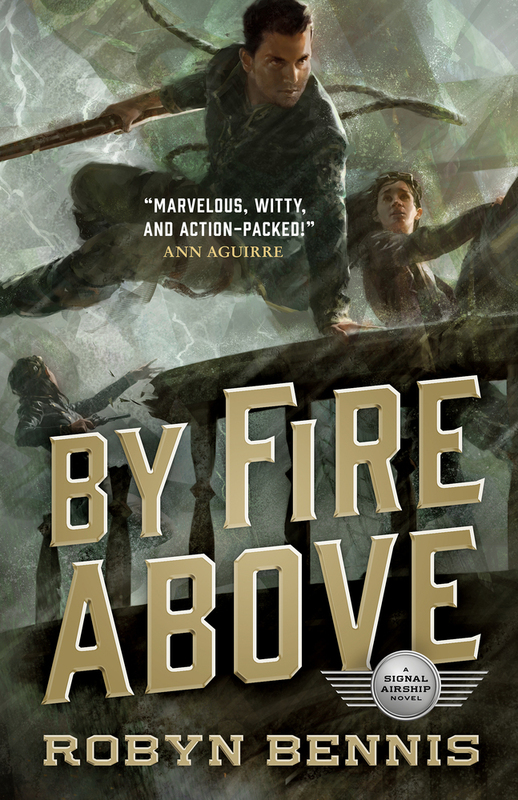 An hour-long conversation with Robyn Bennis, author of the Signal Airship series, which begins with The Guns Above and continues with By Fire Above, published by Tor Books and edited by Diana M. Pho. 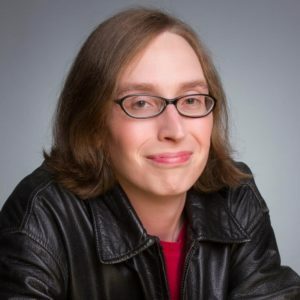 Robyn Bennis has done research and development involving human gene expression, neural connectomics, cancer diagnostics, rapid flu testing, gene synthesis, genome sequencing, being so preoccupied with whether she could that she never stopped to think if she should, and systems integration. She wrote most of The Guns Above within sight of Hangar One at Moffett Airfield, which was once the West Coast home to one of America’s largest airships, the USS Macon. So, Robyn, welcome to The Worldshapers. Now, I always like to start off these things by trying to figure out my connections to the author, but I think in this case it’s that I met your editor Diane Pho at WorldCon in San Jose and she suggested that you would be somebody to talk to and I’m very glad that she did because I really enjoyed the book. I loved Diana. She’s fantastic. She is a great coach have on your team. And I think I just said Diane but I meant Diana. It was interesting, because she was up for the Hugo Award this year, but so my editor at DAW, Sheila Gilbert, and I couldn’t really wish her the best of luck when I met her. And Sheila won. So, yay! But Diana has put me in touch with two or three authors that I’ve been talking to for the podcast. She has an amazing roster. Yeah, she sure does. Well, we’re going to talk about your book The Guns Above and a little bit about the sequel By Fire Above, but first I want to take you back into history, perhaps not quite back to the ages of airships but back to when you started becoming interested in writing and in writing, particularly, this kind of stuff. Did you start with an interest in sort of the science-fiction/fantastical/ and then the writing came later, or how did that work for you? Well, if we’re talking about steampunk and airships in general, it started on an airship, strangely enough, in the age of airships, which not many people know extended into the mid-aughts. There was an airship–people in the San Francisco Bay Area might remember the airship Eureka, which used to fly overhead and flew out of Moffett Field–and through a company, the biotech company that I was working at at the time, I had the chance to go up in it, and it was an amazing experience. Airships, as–you know, we might talk a bit later about how impractical they are, but once you actually manage to get them working and you manage to get them in the air safely they are just a magical experience. You are floating above the world and it’s relatively quiet. It is a nice stable platform to see around in. And it is just…there is a certain sort of calm wonderment that overcomes just about everyone who steps into an airship. Very few people have that opportunity, though. There aren’t very many of them around. No, they’re incredibly impractical to run. In fact, I was…we were ticketed to fly on the airship Eureka about a month and a half before we actually managed to get onto it. Its daily run was scrubbed due to weather twice before we actually managed to get up in the air on it. But going back a little further than that, when did you first become interested in science-fiction/fantasy and in particular in writing. First of all, I guess, where did you grow up and all that sort of stuff? Well, those answers are related to each other, because I got interested in SF/F…probably second or third grade is when I started reading fantasy novels and getting into that. And this would have been in Dunedin, Florida, where I grew up, not perhaps the most inspiring town in the country. So, yeah, there you go. We both come from a little podunk towns, I guess. But, you know, perhaps I wanted to escape it, and fantasy books and science fiction books, which I got into a little bit later, really provided a doorway into an entirely different world that I could just step into. And almost as soon as I started reading them I wanted to start writing them. I think I wrote my first short story in, maybe, fourth grade? It was obviously godawful, but I never really stopped after that, just kind of kept writing. I was always writing something. I was usually writing just for myself and, you know, as is the case for most people who start writing, it’s terrible at first, but after you know 20, 25 years I think it started to get a little better. Do you remember any of the books that first got you interested? I always like to ask that, I get some interesting responses. Was there anything that really stuck out for you in your early life? I remember…I can remember a few images. I do not remember any titles. They were mostly pulp kind of books that even if you showed me the title I might not remember it. They were not from the big names. I was reading out of the school library and I’m not sure the library was the most supported department in that school. It mostly had just kind of paperback novels that, you know, didn’t have legs but were probably available cheap at some estate sale. I grew up I read a lot of Ace doubles and things like that and I remember reading a book once, we were in the car with my parents, and I was maybe ten or nine or eight or something, and they wanted to know…I got really excited. and I read them this section where some guy with a laser beam cut the head off of somebody and it rolled across the floor and there wasn’t any blood because the thing was an android, there was just this glistening gray mass at the top of the neck, and there was a sort of dead silence after I read that out loud, and then my mom said, “What are you reading?”. I would really like to find out what that book was because I remember that scene so distinctly because of my parents’ reaction, but I don’t remember the book. That doesn’t ring a bell for me, either. So, you continued writing then as you were in high school and getting a little older. Did you ever start sharing your writing with your classmates or anything like that? Woo, boy, I was always way too embarrassed. It was, you know…and I have occasionally–and by occasionally, I mean every five years or so–gone back to look at some of that early stuff that I wrote in high school and in college and in my early 20s, and at the time I was too embarrassed to show it to anyone. And in hindsight I believe I was 100 percent right about that. It was the correct choice to not show that to anyone. I did join a writing group briefly and, you know, from the comfort of anonymity showed some of my my short works to the crowd. I will never admit which one. So that you can never track those stories down. And I think that was kind of critical in making some improvements that just are sometimes not possible on your own. You can’t always find your own flaws, and also, just critiquing other people’s work is an excellent tool set for finding flaws in your own work and working on the areas where you’re weakest. Hence, I always recommend when I teach writing that people find some way to share their work with somebody, because you don’t really know if you’re doing something that readers will connect with until you actually have a reader. Yeah. You know, there’s a certain amount that you can do, you know, you can recognize on your own when something is just godawful, which you probably will be when you start out, that’s just, that’s how it goes, none of us are good at things right away except by unlikely statistical chance, but yeah, there comes a point where you just can’t objectively evaluate your own work, you have to turn to someone else to see if there’s something worth keeping there. And, you know, even if there isn’t anything worth keeping there they can show you and help you find the areas where you can improve. And, you know, you just try to improve your work in that area. And if you do that enough times, if you go through enough iterations of that, you will eventually become a really good writer. Now, after high school, you went to university, and you did not study writing at university. Where did you go and what was your degree in? I went to the Ivy League school, Florida State University–we have a proud tradition of burning ivy. So, I studied biology there and went into biotech afterwards, because I had the mistaken impression that by going into biotech I would be able to revolutionize the world, I would find a cure for cancer and, you know, make dogs fly, and just do all kinds of amazing things and, you know, not everybody can do that. But you stayed in the field for a long time. Are you still working in the field as well as writing? I do occasional consulting, but I would say I’m semi-retired from biotech now. Yes. So, did you did you experience in a still, I would assume, somewhat male-dominated field–although that does seem to be changing, I know a lot of women who are going into biology–did that inform your story when it came time to write it? Not yes, but hell yes! My experience, in biotech was…I would not say it was positive overall. There were definitely some bright spots, often when I had a female boss. Hello! I think if any of them are listening they probably know who they are. Hi! You’re awesome! But most of the time it was such a slog to even get people to believe your math. You would think that that would be one thing that would be objective, right? Like, you know, “Hello mister male surface chemist, you have a calculator you can you can demonstrate this on your own, you don’t have to trust me.” But, no, it’s kind of amazing the degree to which women just get shut down in data meetings and experimental planning. You just…you wouldn’t think that that would still be happening today, but it happens in subtle little ways that you definitely notice it when you’re on the receiving end. Were you writing during all this time? Where did the writing group fall into that timeline? Was that still while you were in university or…? That stretched out…that was a bit after. That was probably when I was in biotech. I definitely remember that being connected to San Diego, where I worked for a year at a small company. So, kind of right in the middle, in between those initial forays into writing and actually getting serious about it. But I took the lessons that I learned from that and I’m still using them even today. Just be…the things I learned critiquing other people and having myself critiqued are still…you know, there are definitely elements of that that I’m still looking for when I go through my own work to edit it today and to evaluate it. Well, that brings us to By Fire Above. Before we delve into the process of writing that maybe give a synopsis. Do you want me to talk about By Fire Above or The Guns Above? Oh sorry. Yeah. The Guns Above and whatever you want to say about By Fire Above that won’t spoil The Guns Above. All right. 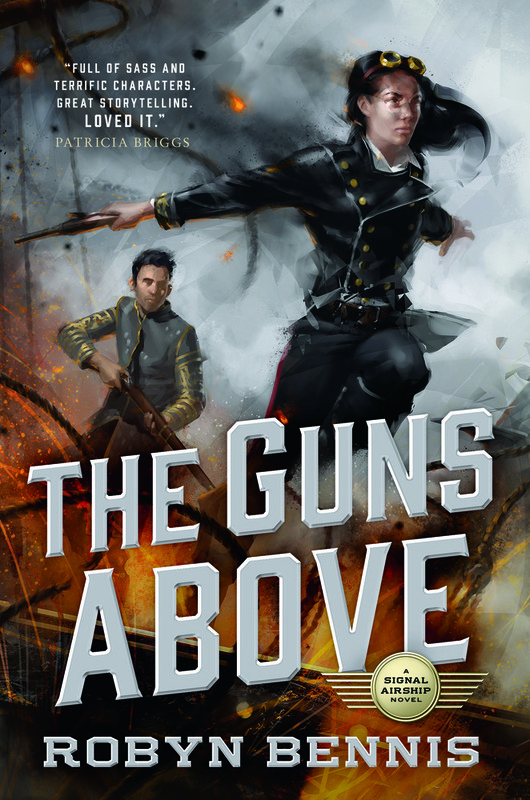 So, The Guns Above follows the exploits of Josette Dupre, who has unfortunately been promoted into an airship where she is going to be the first female commander in the nation of Garnia. Her chief enemies are her superior officers, her own crew, and then the actual military enemies of her nation, in that order. She is being countermanded and undermined at every step. But, you know, no spoilers, it’s just possible that she might win some of these folks on her side by the end of the book. Not to give anything away. Yeah. No, that’s why I always ask the author to do the synopsis so I don’t accidentally give away something that shouldn’t be given away. So, what was the genesis for this. How did this all begin? Well I so I have always enjoyed Aubrey-Maturin series, which is an early 19th-century setting, which follows the captain of first, the captain of a brig, a rather small ship in the British Navy during the Napoleonic Wars, and later the captain of a frigate. And if you’ve seen the movie Master and Commander, that was based on this series of books. I’ve always loved them. I’ve always enjoyed the technical aspects of them as well as the interpersonal relationships between the characters, and when I stepped aboard the Eureka at Moffett Field I thought maybe I could bring that, bring airships into that world and tell the same sort of story. You know, obviously, theft is better than creativity when you’re trying to sell something. Kind of bring airships into that world, tell the same kind of story with the same kind of characters and an attention towards technical detail, and see what happens. And, you know, I believe it turned out pretty well. I would agree with that. I enjoyed it very much. So, with that idea in mind, how did you go about further developing it into an actual novel? Oh, boy. So, that started with about three months of research and brainstorming. About the moment I stepped off the Eureka I went to Amazon and started ordering books about airships, non-fiction books, some of them written by the war department during the brief flirtation with airships during the ’20s and ’30s, some of them just, you know, historical pieces from secondary sources, and I kind of learned everything I could about airships, not only about the people who flew them and what they were intended to be used for but also the, you know, the technical aspects of putting them together. It’s kind of funny, you know, you don’t really think of it today when you look at these ships, the grand airships of the ’20s and ’30s, but at the beginning of that period nobody really knew how to make them work optimally, and there are some interesting books that are almost arguments with other engineers about the best ways to build airships. I got an interesting kind of background that is reflected in the first act of the book, where my captain is lamenting the fact that she is being put in an airship that is a “revolutionary new design,” which is otherwise known as a death trap. Of course, at the time I had no idea how I was going to use that. It was just, you know, I just kind of built up this knowledge base in my head for later use without considering how it might be useful. I just picked up as many facts as I could along the way and brainstormed as many little elements to the world. I was kind of building the setting, or at least the building blocks from which I would later build the setting at this time. And after that, I spent a while outlining it. I didn’t actually start writing until five or six months after I actually began the project. I’m going to ask you about your outline and what it looks like in a minute, but I want to go back to the airship. First of all, how closely does your airship design model anything that we had in the real world? It doesn’t model any particular airship. It does take elements from various ships, however. There was never, to my knowledge, a successful design that used a steam turbine, for example–that was outdated technology by the time we were actually building large airships in earnest. The one element that I know people may be least credulous about is, however one that is rooted in the history, and that’s the fact that for a little while we made airships out of wood. The…I’m probably blowing this pronunciation, it’s German…the Schütte-Lanz Company actually built airships out of wood for about a 10-year period, and in many ways they were superior in performance to the contemporary aluminum, or duralumin designs being produced by the Zeppelin Company at the same time. The downside was that the airships fell to pieces in a few years because wood doesn’t stand up well to moisture, of course. Which you comment on with the steam power and its effect on wood. I went through a period when I was fascinated with First World War aviation and I still remember as a kid being startled to find out that the airplanes were made out of wood with doped fabric stretched across them and I read a story years later about the Mosquito bombers in the Second World War, which were also made out of wood. You know, it has its qualities. It’s not practical overall but there are definite definitely niche applications. I was recently, in fact, at the Boeing Museum in Seattle, and they have an example of one of the very first fighter aircraft up, and the damn thing looks like it’s going to fall apart on the ground. When you look at it, you look at this thing and you think, “This is made from string and papier mâché, probably.” It’s just an absolute mess, and you wonder about the bravery/madness of the people who went up in these things. You touch on that, too. But we’ll talk about that in a minute when we get to characters. We never in our world had airship-to-airship combat, did we? I don’t believe we did. Unless there’s some obscure historical incident that I don’t know about. Mostly it was airships versus fixed-wing aircraft. And it was a race, you know, essentially it was a race into the air. The most famous examples, of course, being zeppelins flying over Great Britain. And they would, you know, start out at a fairly high altitude, which they could achieve with relatively little effort. The aircraft that were scrambled to shoot them down had to first climb up to that altitude and then had to catch the airships. The speed difference at that time between an airship and a fixed-wing aircraft was not huge. So, it took quite a bit of work, actually, on the part of the fixed-wing pilots to actually get those Jerries. Were they still using hydrogen in the First World War? Weren’t they? They were, in fact. Yes. Which, you know, not a super great idea, nut I believe Germany was simply limited by the resources. This is another thing that I just kind of dance around in The Guns Above, where the hell they get their luftgas, which is this world’s version of helium. In the real world it requires natural gas deposits or oil deposits, where the helium tends to collect in domes above those deposits. And it also requires extremely low-temperature separation technologies. So, I just kind of decided to not mention it. That’s my way around that particular problem. So, when it came to the airship combat, which is lovingly detailed, that must have taken a considerable amount of thought on your part. I realize that some of it does bear resemblance to sailing ships trying to maneuver to, you know, rake them from the stern, that sort of thing. It comes across as very believable. Well, I spent a lot of time trying to figure out how it might actually work. This is something that never happened in the real world, so, you know, that is both a problem and an opportunity. It’s a problem because I have to come up with a convincing way to get these folks shooting at each other. Of course, it’s an opportunity in that I could be completely wrong, and no one will ever know because hopefully this will never happen. But I really did make an attempt, including to the point of doing, you know, calculating angles and determining the apparent size of vessels at varying distances to try to get an idea of what this would be like. I think I spent several days just trying to get in the heads of my tacticians and, you know, what would you want to do. If I was trying to blow up an airship from another airship which, you know, is not hard to think about, because that’s one of the coolest things you can imagine except for all the death and chaos. Once you sanitize that, though, it’s pretty awesome. What would I be trying to do? What would I be trying to hit? How would I try to avoid taking damage? What would the situation be on deck? What would be going through the minds of the people involved in this in, you know, in this terrifying chaos? I just spent several days trying to get inside their heads and, you know, I think the results speak for themselves. Now we go back to the outline. What did that look like? What does your outline look like? You’ve done two and I presume there’s a third one coming? I hope? Well, we’ll see. I’m not currently contracted for a third one. So, if you like the first two, tell your friends, get those sales numbers up so we can get a third book. But my initial outline actually looks surprisingly like the finished product. There are a couple of chapters that are in the outline that did not show up in the final book because I was running out of space. You know, some of your listeners may know this and some may not, but when you’re writing a debut novel in this sort of SF/F genre, you kind of want to keep the links under 100,000 words. Anything above that has a tendency–this isn’t a rule, but there is a tendency to scare off potential publishers if your book is too long, and so, I had to kind of cut out a couple of chapters in my outline. But other than that, it is largely what I originally wrote. Not super detailed, which…you may have gotten to the heart of the reason it didn’t change very much. I tend to write in broad strokes in my outline. I think it might have been two or three pages long, and then I write slightly more detailed smaller outlines for individual chapters as I’m going through the book. You started with…obviously the airship was the big idea…but then you had to have characters. So, how did you come up with the characters that you needed? There are two main characters, I guess. How did you decide what characters you wanted to tell the story and then how did you make them come alive? Well, initially, I stole them, which, you know, I’m not ashamed to admit that. I stole from the best. though. I stole from the Aubrey-Maturin series, and I think astute readers who have read that series and my own books will notice elements of Captain Jack Aubrey in Josette, and they will notice elements of Dr. Maturin in Bernie, but, you know, from there, obviously, you’ve got to file the serial numbers off. So, I did much the same thing that I do when I’m approaching technical problems. I tried to spend a few days in their heads. Times when I was not writing or outlining or researching, I just kind of spent my free time during the day, you know, during boring biotech meetings, just trying to imagine how these characters think. I think this gets to what some authors describe as letting the characters speak for themselves. And I’m not sure if I buy into that, but it’s certainly true that when you start thinking about how a person, how a fictional person thinks, it doesn’t take you very long to develop their moods, their quirks, their driving goals, you know, you just kind of have to find those moments to think about this and to put yourselves in their head, and it just kind of seems to emerge. You mentioned, you know, sort of approaching it like you’ve got a technical problem and you’ve talked about how your experience and biotech influences Josette’s experiences, and you just mentioned that sitting in boring meetings gave you time to think about this, so, are there any other ways in which your experiences in the sciences helped you with the writing of the book, or influenced it in some way? Certainly, you know, I think you might have just gotten to the heart of Josette’s problems right there. You know, I’m sitting in a data meeting where people are ignoring me, and I’m like, “Well, how would she feel about this? I think she’d want to shoot somebody. Hmm. Interesting character trait.” I do think that just having a background in science or technology in general does certainly teach you, one, to do your homework, and two, to really think things through before you commit to them. Anyone who has worked in biotech for very long knows that the best ideas don’t pan out. Nine times out of ten you can have the best most succinct and most elegant idea for, you know, a particular chemical process to deposit the chemistry that you need on your device, and then you run it in the lab and it’s a complete disaster. You get used to that kind of stuff, and I think it teaches you to…I always hate these succinct one-sentence bits of advice, but I think this is essentially the equivalent of the “kill your darlings advice,” which, you know, if you could expand on it is, “Don’t get too attached to any given concept, to any given plot point, to any given scene that you want to put in your book. Be willing to adapt to the needs of the story and the needs of the character. Let the character takes you where they want to. Don’t railroad them into a particular path.” Be willing to let go of your brilliant ideas. You can always use them later in a different book. 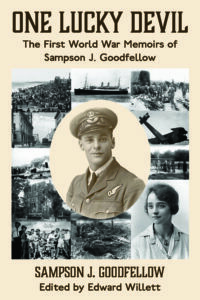 Now, of course, this is a war novel, which meant setting up a geopolitical situation that would support the war, and then it’s also…I mentioned that I have the interest in First World War aviation, and also recently I edited the memoirs of my grandfather-in-law, who was in the Canadian military to start with in the First World War, first as a truck driver in France and then he decided that wasn’t exciting enough, so he joined the Royal Air Force. As a navigator on a Handley-Page Bomber. Which typically, you got about six missions and then you crashed, or were shot down, and he indeed was shot down, but he survived. 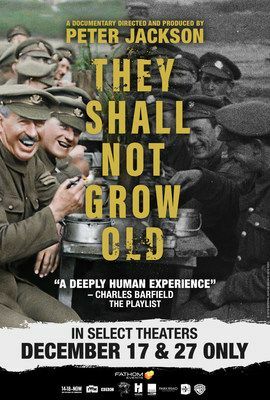 And reading your book…and also, recently, you may be aware of Peter Jackson’s movie They Shall Not Grow Old. Yeah, I saw that, that was excellent. And all of that related to this a little bit, because the people in your book are fighting this war. They’re really just doing a job, but they’re kind of trapped in this war that doesn’t seem to make a lot of sense. No. I mean. I’m sure it makes sense to the higher-ups. Of course, they’re not the ones who have to do the dying. As someone points out in the second book, they’ve got people to do their dying for them. And, of course, all of their little desires for land and influence and power make perfect sense to them, even as the war devolves into a pointless morass, which is evident to anyone who opens their eyes to it. And I did very much draw from the, just the pure pointlessness of the First World War, to capture that, you know, that sense of, you know, patriotism/just complete incomprehensibility of what the hell we’re fighting for. And yet, you know, essentially the characters are fighting for their comrades and for each other, which does seem to be very true to the way things work in real-life wars as well. Yeah. Once, you know…and that’s the trick, right? That is what allows a guy in a funny hat to tell you to go die on that hill is, you know, you would tell him to get lost if it was just you and him. But, you know, you’re there with everyone else and everyone’s going there. So, you know you can’t abandon your friends. Now with the book written…did you write the book and then sell it? I did. Which is usually the case with debuts with rare exceptions. I had the entire thing written and then did, you know, essentially cold emailing to catch the attention of agents. Out of, I believe, thirty-two agents that I submitted a query to, one was interested in the book straight through. A couple asked for, you know, twenty pages, and a few asked for the complete manuscript, but only one saw the, you know, the full potential of this book when he read through it, and that was Paul Lucas who is a rock star. And then he went about, you know, shopping it around. I should back up just one step. Once you had the draft written, what did your rewriting process look like, your revision process? Ooh, it was a lot of trimming. I went through and tried to trim out every extraneous technical detail on my first edit pass–and there sure were a lot of them. My ultimate goal, which, you know, I was semi-successful at, was to not have any information dumps, to not have anything that feels like it’s just information for information sake. Oh, yeah. That really gets my goat. So, I tried to cut…there was a bit of that, certainly, and there was a lot of people wandering around thinking about the technical aspects of the things around them, which is another thing that kind of gets me. So, I took that out wherever it was not absolutely necessary for a reader to understand the environment that, you know, that I’ve put them in. So that was my first draft, or rather my second draft, and then I just kind of went through it over and over and over again, paying particular attention to the beginning and the end and the most critical plot critical points in the story, just trying to make it a little bit better with every draft. I think I ended up with something like 16 or 17 drafts by the end of that. Did you share it with anybody to read along that way, or were you doing it yourself? At that point I did. I shared it with a combat veteran that was working with me at the time, and I shared it with a couple of writing pals, and, you know, I think they really did help make it better. They saw things that I missed. How long was this entire process before you were ready to submit? I think that might’ve taken about three to four months. I really took my time on this one. Now, you did sell it to Tor, and your editor was Diana Pho, Hugo-nominated editor. What was her…what’s her editorial process? What did she come back to you with? So, she came back with a lot of questions about the world and just an amazing depth of understanding. I mean, I think she connected with this book immediately and she wanted to make it better in the same way, you know, a parent wants to make their child better. She had a real passion for it and she really pushed me to flesh out the world, to make it feel lived in, to make it feel as if it had depth. That was three or four more edit passes, just kind of going through and getting her feel each time and, you know, making adjustments as necessary. She was wonderful. So, then it was time to think about the sequel. Did you have more than one book in mind when you wrote the first one, or was this one where you had to discover a way to carry on the story? I did have more than one book in mind, mostly because I had heard that you always want series potential when you’re shopping your first book. And so, I kept that in mind from the outline process onwards. I wanted to tell a complete story, but I also wanted to leave room open, and people who read carefully will notice that there are a few little nuggets, little nuclei, seeded throughout the first book that will come back in the second book. And if we get a third book, there are more in the first and second books that will come back in the third book. Would it be a trilogy, or would it be an ongoing series? I would love for it to be an ongoing series. It’s always an “if,” I know. I will milk this for as long as it’s a cash cow. I mean, I love writing and I wish to continue…I have always been the kind of writer who thinks out the potential. And so, yeah, I, just in my idle moments without even trying, I’m coming up with ideas for more and more sequels. I could keep writing this indefinitely, essentially, because I come up with thoughts on two additional books for every one I write so far. What was the response from readers when the book came out? How did how did you feel about the response that you had? I was, you know, ready for the worst. I had braced myself for, you know, all these these…”Not everybody is going to like your book, Robin,” is what they told me. “You’ve got to be ready for those horrible reviews.” But everybody seemed to love it. So, I don’t mean to pat my own back here, but I really had no trouble with the feedback that readers and reviewers gave me, because it was almost all glowing. I’m awesome, it turns out. Have you done the convention thing, where you meet your readers in person sometimes? I have. I’ve been going around to conventions and I’ve been to, you know, ReaderCon and WisCon, hung out at some of the Bay Area cons while I was still living there. I’ve since moved to Wisconsin. And I love to meet readers. I just love talking to them about anything but my book, which usually I managed to get them off of after a few minutes. Well, it is something that I think readers sometimes don’t realize, that by the time a book comes out you’ve seen it a lot. And you might perhaps like to discuss something other than the thing that you have spent so much time reading and thinking about. Yeah. You would never think that you would get tired, you know, talking with someone who loved your work, but just…you know, I have been over and over this book so many times that, you know…”Hey, let’s talk about that new CERN super-collider that they want to make. Let’s talk about SpaceX. Let’s talk about the Mars probe. Let’s talk about anything but my book. Now, brings me to the more philosophical questions. You started writing because you started reading, as many of us do. Why are you still doing it? Why do you write? Why do you think any of us write? Boy. Well, you know, I see human beings as natural storytellers. That seems to be a fundamental part of our psychology, rooted so deep inside of us that you could never shake it out. People that you meet on the street, you know, telling you about their brother-in-law or something will tell stories in a three-act structure about their own life. It just comes so naturally to people to want to tell a compelling story that interests somebody. There is a thrill, you know, a little hit of some kind of addictive substance that is released into the human brain every time you look across the table at somebody and see them captivated by the story that you’re telling them, whether it’s fiction or nonfiction. And, you know, it’s an addiction. Once you get into that you are never getting out. You’re just going to want more and more hits of that, and you are going to keep on writing. If somebody could turn it into a…you know. somebody in the biotech industry…could turn it into a drug, they’d make a killing. You wouldn’t have to read anymore. You just, you know, inject something and you feel like you’ve read a great book. I would not be able to get anything else done. Yeah, I would be terrified to do that. That might be the end of the human race right there. And have you ever thought of writing something outside of the science fiction and fantasy field? Are there other kinds of stories that would appeal to you as a writer? Hoo boy. There certainly are. I don’t have anything in particular in mind, apart from the notebook full of random ideas, rather the eight notebooks full of random ideas that I’ve kept over the years. I kind of love the freedom, though, that fantasy and science fiction give you. You’re not restricted by the real world. 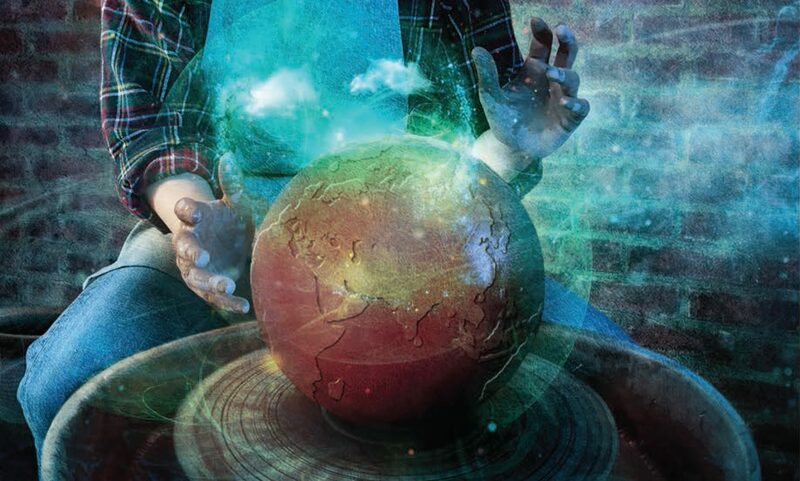 You can, you know, you can think of something cool and have it happen, whereas with boring old reality you have to make it actually make 100 percent sense, not only makes sense on a theoretical level but, you know, make sense on an empirical level, because people know how stuff works in the real world. So, yeah, I think I’m probably gonna stick to SF/F for now, but, you never know. Are there people writing in the field right now that you are particularly enjoying their work? That you would like to mention? Oh. my God. Becky Chambers keeps putting out such wonderful stuff. She has…and, you know, she is one of the people who in fact read The Guns Above before anyone else did and gave me very valuable feedback on it and, she just…the things that come out of her mind. I am in awe of. Justina Ireland, too, is just writing these amazing books. I did not think zombies could be cool again. I was extremely skeptical when I heard about Dread Nation, but holy crap, she has such amazing skills as a writer. Everybody who hasn’t read that just needs to pick it up immediately. Do you find that as a writer you read differently than you did when you were just a reader…or was there ever a time when you were just a reader? Unfortunately, yes. This is, you know, being a writer kind of ruins some books for you. You start to notice tropes that you’ve used. And in particular you notice ideas that writers fifty years ago somehow managed to steal from you. You know, like, somehow Terry Pratchett went forward in time, stole one of my notebooks and took some of my ideas, and I really resent that. You know, when I’ve built my own time machine I’m going to go back and have a talk with him. I find that…one thing I find. I do quite a bit of copyediting, too, and one thing that certainly leaps out at me from anything I read now is whenever there’s a repeated word or, you know, some sort of infelicity in that way. It really jumps out at me now. Usually it doesn’t ruin the story for me, but I’m suddenly aware of the…you know, “Pay no attention to the man behind the curtain?” I’m suddenly aware of what’s going on behind curtain. So, you don’t have a third book contracted yet. Are you working on it anyway, or what are you working on right now? Right now, I am working on a urban fantasy which will hopefully be out sometime this year, and tentatively entitled The Devil’s Guide to Managing Difficult People. It is about a woman who speaks to the Devil and gets unwanted life advice from her. It is semi-autobiographical and it’s a bit more of a fun kind of romp. It’s a little less serious, but hopefully also stabs the reader in the heart at least a couple of times. I just can’t avoid doing that, obviously. There’s not a firm publication date on that? No, not yet. At the advice of my agent, we’re going to try self-publishing this, which is, you know…I want to see how that world works It’s becoming more and more popular and it is becoming more and more practical for a writer to do self-publishing. So, you know, I’d like to dip my toe into that. Well, it does have the advantage, too, that you don’t have…one thing I’ve found–I’ve dabbled in it myself, I have a publishing company called Shadowpaw Press that I put up the those First World War memoirs through, and also a collection of my short fiction–and one of the things is you don’t have that enormous “hurry up and wait” thing that happens in traditional publishing, where you write the book and then you wait, and then you revise the book, and then you have to wait for publication. So I think you’ll find the speed at least is something…and you don’t do it until you’re ready, of course. Yes, of course. And that is that is one of the nice things, you know. This book has to be perfect before I will put it out. That is kind of part of my psychology. And I have found that, you know, this is somewhat…you know, publishing a book is never a calm process but, you know, this is a bit less of that stressful “we have just come up with these changes we want you to make, you have a week” kind of kind of situation that occurs to you after your book has been sitting in a line somewhere for three months. Which is, you know, that’s just a natural part of publishing with a big publishing house, they’ve got a lot of other authors, so that “hurry up and wait” is going to be part of your life. I think, too, perhaps…I’m guessing…that in your time in biotech that you have quite a bit of project-management experience which should also be a valuable skill in self-publishing. It certainly is. It’s certainly helpful to juggling all of the different tasks that your publisher will usually take care of for you, such as the cover and the copyediting and the marketing and all of that stuff. Being able to do all of that and work on other projects is an incredibly valuable life skill for an author. So I definitely suggest that any author who wants to succeed spend 25 years in biotech. Well, as I mentioned, my wife is an engineer, with a lot of project management, and I really should get her to give me a few tips because I’m not very good at it myself. It’s definitely helpful. It will cut down on your stress level. I can just about guarantee that to you. So just wrapping up here, where can people find you online? They can find me at www.robynbennis.com. They can also find me on Twitter, if they if they like that particular format, at @According2Robyn, and if they want to see me in person they can go to Geneva Steam Con in Delevan, Wisconsin, which starts the 8th of March. They can also go to the International Steampunk Symposium in Cincinnati, Ohio, which runs from March 29 to 31, and I will be the Guest of honor there. Coming up in the world. Oh, let me give you one more: I will also be at the New Hampshire Writers Retreat from the 26th to the 28th. So check out the links to that through my Facebook page. The 26th to 28th of…? Well this should go live sometime, probably towards the end of February, I think, so this will time out well for that. And if by any chance you’re listening to this after that, because of course it doesn’t go anywhere once it’s up, I’m sure if you go to Robyn’s website you’ll be able to find out where she’s going to be next. Yes, correct. And this is 2009 for you folks in the future. It was an interesting year, at least, starting in January I feel like we’ve lived about five or six years since January 1st. Or else we’re already in the future. I guess we are in a way. Yeah. Yeah, ’cause that future sneaks up on you, doesn’t it? It sure does. Well, thanks so much for doing this, Robyn. I really enjoyed the chat. Thank you very much. This was fantastic.